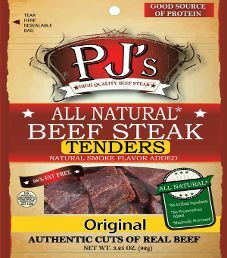 The next review on PJ’s All Natural Beef Steak will be on a 3.25 ounce/92 gram bag of their original Tenders Style beef steaks. This bag was kindly submitted by the Marketing Manager Samantha Alderfer. 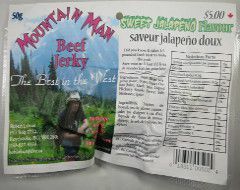 The next review on Mountain Man will focus on a 1.8 ounce/50 gram bag of their sweet jalapeno flavored beef jerky. This bag was kindly submitted for review by the founder of Mountain Man, Robert Lahue. 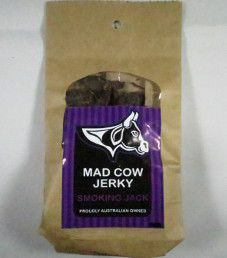 The next review on Mad Cow Jerky will be on a 0.6 ounce/18 gram bag of their Smoking Jack flavor. This flavor is described as having a smoky taste, along with the whiskey brand Jack Daniel’s. This jerky was graciously submitted by the owner, Mary-Anne Delost (M.A.D.). 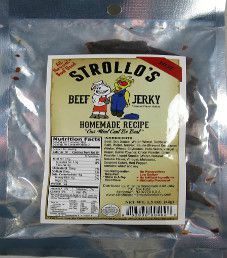 This will be the second review for Strollo’s hot beef jerky. 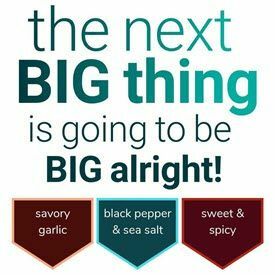 The ingredient list has since been tweaked, and improved health wise. This 1.5 ounce/42 gram bag was kindly submitted for review by the owner, Michael Strollo. 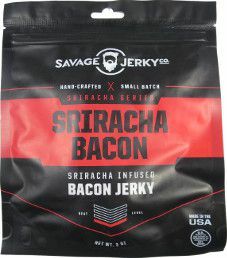 The next review on Savage Jerky Co. will be on a 2 ounce/56 gram bag of their sriracha flavored bacon jerky. This bag was graciously submitted for review by the Savage Jerky Co. team.